“With President Trump, I’m ready to get off defense and go on offense. Trump is going to slaughter some sacred cows, and I’m ready for the barbecue” Representative Brent Farenthold (R-TX-27) told the Austin American-Statesman. Tough words … but apparently that barbecue will not include funding for Representative Farenthold’s own staff … because he voted a big YES for the Fiscal Year 2017 Legislative Branch Appropriations bill funding the offices of Members of the House of Representatives … this YES includes an INCREASE of $73 Million to support agencies of Congress, security and police forces, services for visitors, and Capitol operations and maintenance. The total included for the House and joint operations, excluding Senate-only items, is $3.48 Billion. The $73 Million increase was the last vote in the process … before that the House had a chance “to slaughter some sacred cows” … for example, to defund the Post-Speaker Office that retired speakers enjoy for up to five years after they leave office. Over the past 45 years, the perk has grown to include office allowances, Franked Mail privileges, and staff help for the former speaker. Former Speaker Dennis Hastert spent in excess of $1.5 million in taxpayer money running his post-speaker office. Meanwhile, he was making big money as a Washington, DC lobbyist and had the disposable income to pay $1.7 million to someone who was blackmailing him over allegedly molesting young boys. Former Speaker John Boehner has used this perk to send taxpayer’s a bill of $95,252.48 … and he has only been gone for a few months. An amendment was offered to defund this program, but the Republican-controlled House Rules Committee blocked the amendment from being considered on the House floor. [FYI : There is a bill to end the Post-Speaker Office program, H.R. 4195, but Erik #MathGuy Paulsen has not become a co-sponsor. But one amendment the House did vote on was offered by Congresswoman Marsha Blackburn (R-TN-07) asking Members to cut their spending by 1%. Now, let’s put that into dollars that the #MathGuy can appreciate … Erik Paulsen has a legislative budget of $2,503,492 for this legislative term … so a 1% cut could mean trimming spending by a meager $25,034.92 … Representative Farenthold said YES but #MathGuy Paulsen said NO WAY are you cutting MY budget. The Blackburn amendment failed. $25,034.92 over two years … yet the #MathGuy says NO … ok, maybe that would be asking too much for him to cut a part-time employee … or one of his “shared” employees (“shared” means spreading the cost of an employee across many Members when they actually work on behalf of the political party). Nah, that would be heartless … but what if he just cut his Franked Mail ? 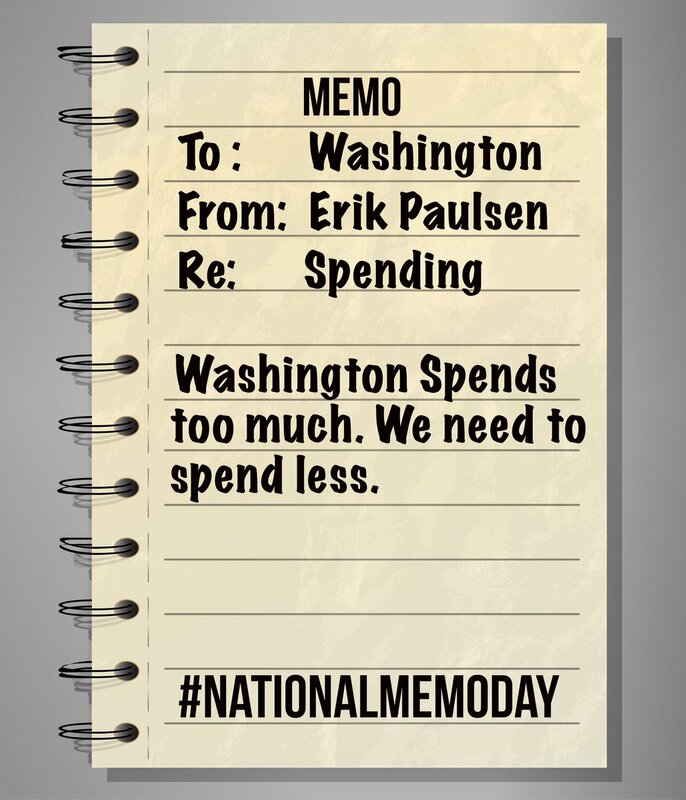 Ya know, those mailers that you get telling you what a great job Erik Paulsen is doing to cut Washington spending … well, last year, he spent $44,301.11 of taxpayer monies on Franked Mail, you would hope that even the #MathGuy could see that to cut Washington spending has to start in his office.